BIOSTAR releases BIOS updates for the brand’s Intel 200 Series motherboards to support Intel Optane technology drives. 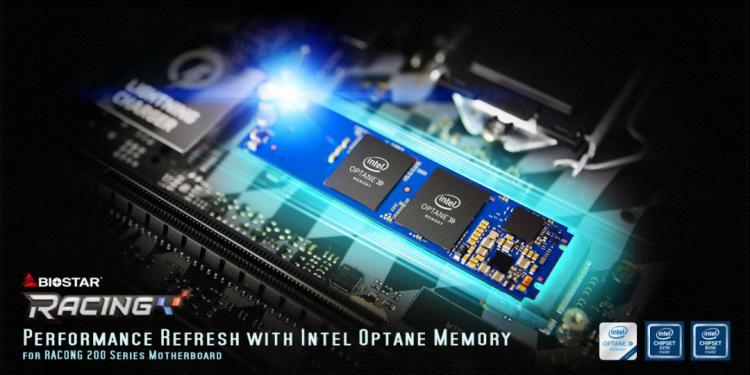 Now, the BIOSTAR RACING 200 Series motherboards support Intel Optane technology for faster cashing and overall storage performance resulting to shorter boot times and load times. Using the M.2 slot in the BIOSTAR RACING 200 Series motherboard, you can save up on SATA drive space and run applications faster. A 16GB Intel Optane Memory M.2 Drive costs around $40 which is a very affordable upgrade with great price-performance benefits when used as a caching drive. Run applications faster, enjoy faster boot up times at a very affordable cost. With the BIOS update, BIOSTAR RACING 200 series motherboards along with 7th Generation Intel Core processors, benefit from Intel Optane technology to the fullest while using your existing hard drive. This is made possible by storing the most frequently used data and programs closer to the processor, which allows the system to access this information more quickly and improve system responsiveness. 3- Power on the motherboard and press 'F12' during POST (power-on self-test) screen. 4- After POST screen, a menu for BIOS update will appear. 5- Select USB device and press 'Enter', it will go into the BIOS update screen. 6- Use the BIOS file listed on the left to update. 7- Wait for the system to load the BIOS file. 8- Press 'Y' to flash the BIOS and erase DMI data. The system will update the BIOS automatically. 9- After reboot, the system will run with new BIOS. Turn-off the computer and install Optane Memory on M.2 slot to enjoy the performance upgrade. Check out BIOSTAR RACING Intel 200 Series motherboards at the BIOSTAR website.